The IITA community, including scientists and research support staff, are reminded once again and encouraged to actively support the Institute’s decision to implement an Open Access policy for research starting this year. 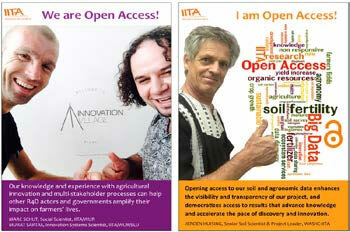 Open Access means that IITA’s research publications and data should be available for the world to read, to learn from, and to build upon. This implies the immediate, irrevocable, unrestricted, and free online access by any user worldwide to IITA information products, including photos and videos, and unrestricted reuse of content (which could be restricted to non-commercial use) subject to proper attribution. Launching the Open Access awareness campaign, Valerie Poire, IITA’s Open Access Focal Point, disclosed that a brochure, posters, and guide for authors on Open Access publications have been developed to guide staff. In addition to these, she also noted that staff members must now adopt new practices to aid the Institute’s task of providing free online Open Access to the results of its research. One of such practices is the development and implementation of a data management plan for new projects. Another is publishing research outputs, data, publications, and information products under Open Access licenses and depositing such in designated Open Access repositories; as well as the need to comply with specific deposit schedules for articles, books, reports, databases, and pictures as the case may be. To facilitate this transition, and help implement the necessary changes, Valerie unveiled the first Open Access brief designed to help Unit and Project Managers familiarize themselves with the changes brought about by the introduction of Open Access best practices. Which Open Access policy and regulations should your unit or project comply with (CGIAR, IITA, donors)? What is an Open Access embargo period (deposit schedule)? What are your Open Access responsibilities as Unit or Project Managers? How does Open Access impact your unit or project? Which Open Access repositories does IITA use, and who should you contact to deposit your materials? Valerie is preparing information briefs describing how Open Access will impact the professional activities of different categories of staff, along with a series of posters featuring IITA staff who champion Open Access. Before the end of the year, she will also train staff on Open Access. Full registration for Aflasafe approved!